Real-life politics is rarely presented like an exciting thriller, but then real-life politics is rarely as exciting as this. In the UK we haven’t recently had momentous enough events – the best we could do would be David Cameron and Ed Milliband arguing about hospital funding. Things are different in South Africa where everyone knows the huge events that happened when Nelson Mandela was released from prison and apartheid ended in South Africa – even if our knowledge of the dates is a little hazy. (1990 and 1993, since you’re asking). But how exactly did these events come about? Plot for Peace is a documentary that tells a remarkable story, explaining how the outcome was facilitated to a large degree by a mysterious Frenchman. Looking back it is easy to assume that the process to remove apartheid was bound to succeed, but that is to slip on a pair of the rosiest-tinted specs. In no small part the successful release of Mandela and all that that led to was thanks to Jean-Yves Ollivier. He flew back and forth between African capitals introducing heads of states and bringing some trust to relationships that had previously had none. In keeping with the mystery Jean-Yves Ollivier is not named or shown until well into the film, which starts with a lot of archive footage of violence against civilians. Police dogs attack, huge whips are used, people are dragged away, before a title at the beginning of the film locates us in South Africa in the 1980s. The violence is set to music with no voice over explaining anything. For a few moments the images are out of context and the filmmakers wallow unnecessarily in grainy atrocity. Ollivier is a businessman dealing in commodities in Africa. He had however experienced colonial/African turmoil at first-hand. He and his parents had had to flee the violence in Algeria when it became independent in 1962, even though he had been born in Algiers. He could see that racial discrimination in South Africa had to end, and was prepared to commit much of his energy to helping achieve that peacefully. The directors Carlos Agullo and Mandy Jacobson have managed to get interviews with many of the big players from the period. Former heads of state include South Africa’s Thabo Mbeki and Mozambique’s Joachim Chissano, as well as apartheid minister of Foreign Affairs Pik Botha, Winnie Mandela and many more. Through their stories a picture of the importance of the behind-the-scenes work of Ollivier is built up. By the end you do wonder why the world hasn’t heard of this fellow before. 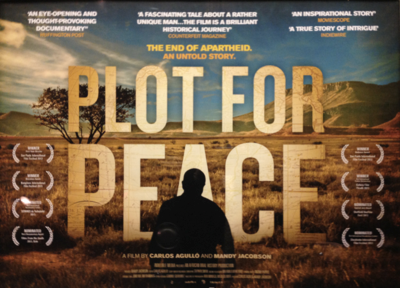 Plot for Peace is an intriguing look behind the scenes of one of the world’s major political events. It shows how big agreements between countries are not foregone conclusions but actually depend on trust, the hard work of unsung people, personalities and even luck. At times the music is overwrought and emotional but it presents an important period of global history with all the excitement of a thriller.